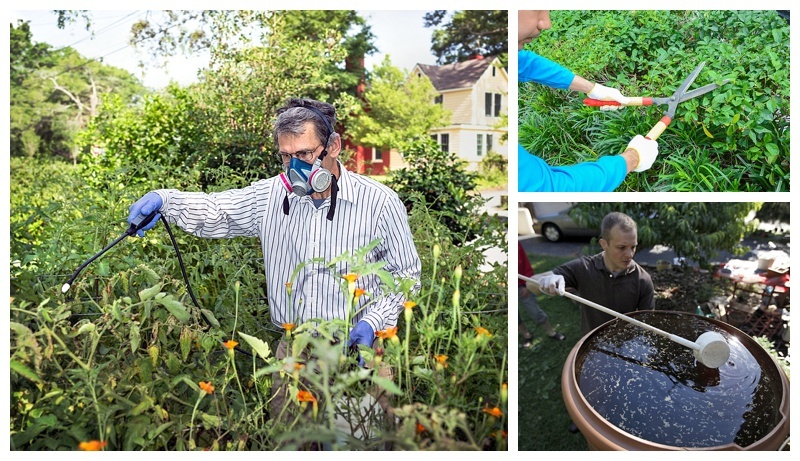 You can help prevent dangerous mosquitoes from developing large populations on your property through proper sanitation methods and preventative insecticide applications. Keeping the mosquito population controlled from the start of the mosquito season is best. It is recommended that you start your insecticide spray applications listed in the treatment section before your property is overrun with mosquitoes. Places where rainwater gathers and you cannot drain it, should be treated with a larvicide as recommended in the treatment section. Containerized ponds, animal watering troughs, flower pots and other areas that do not have flowing water or water that can seep into the ground or into other bodies of water can be treated with larvicides as well. How often you apply the larvicide will depend on the product chosen and the amount of rain in your area. Preventing mosquitoes from biting is a top priority for many people; especially when the weather is warm and lots of time is spent outdoors. With mosquito born diseases such as Zika, West Nile, Dengue Fever and Chikungunya , it’s even more important to re-evaluate your mosquito control efforts. There is no sure way to completely eliminate the risk of exposure to mosquitoes. There are, however, a couple ways to reduce the risk. These include reducing mosquito populations around your property, and protecting yourself with repellents and dressing appropriately. Taking steps to prevent mosquito harborages can go a long way in reducing the overall population in your immediate area. Reduce breeding sites by eliminating any and all standing water found in: Gutters, small puddles, planters, buckets, and bird baths. If you can't remove standing water, treat with mosquito dunks, which are larvicides that kill mosquito larvae. Also make sure to reduce resting areas. Bushes, tall grass, plants, and even piles of yard debris are shaded areas where mosquitoes can be found in the heat of the day. Keep your grass cut, shrubs and bushes trimmed and yard debris clear to eliminate hiding places. Make sure to keep all screen doors in good repair. Check all windows and door frames for gaps, and seal them if possible. Personal mosquito repellents are a powerful tool in protecting yourself from mosquito bites. You should use a repellent if you plan on being outside for an extended amount of time. Read labels carefully and choose the product best suited for your conditions. The most effective repellents are ones that can be applied directly to skin and/or clothing. Repellents containing DEET are best. Here are some things to keep in mind when using repellents: Make sure to apply as often as needed. Depending on what kind of repellent you are using, you may have to wash clothing that has been treated before wearing again. Current weather and the activity you are doing can affect how long and how well the repellent will work. Even when it’s hot outside, cover as much skin as possible with cool, breathable clothing. For more information on controlling mosquitoes, click the link in the description below. And it’s that easy with the expert help from Do My Own Pest Control dot com! Subscribe to our channel for more DIY and product videos! There are several things you can do to help stop mosquitoes that carry diseases. This video explains some of the steps you can take to prevent mosquitoes from breeding around your property, as well as some general mosquito bite prevention tips. 240 of 256 people found this article informative and helpful.